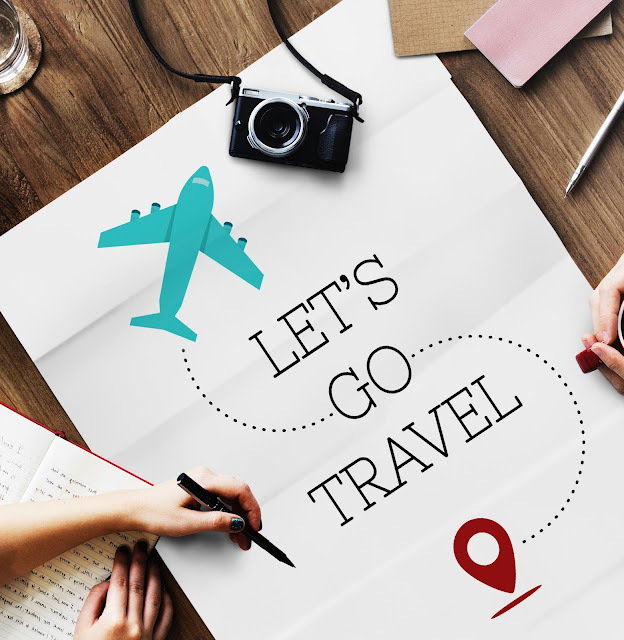 Cambodia is one of the places I've always wanted to visit because of Angkor Wat, an ancient temple that's been around for centuries. Also considered to be part of the 7 wonders of the world. Finally, after years of talking about going to Siem Reap where it is located, late last year, just about a week after my Hongkong trip, Cebu Pacific held a seat sale and voila! 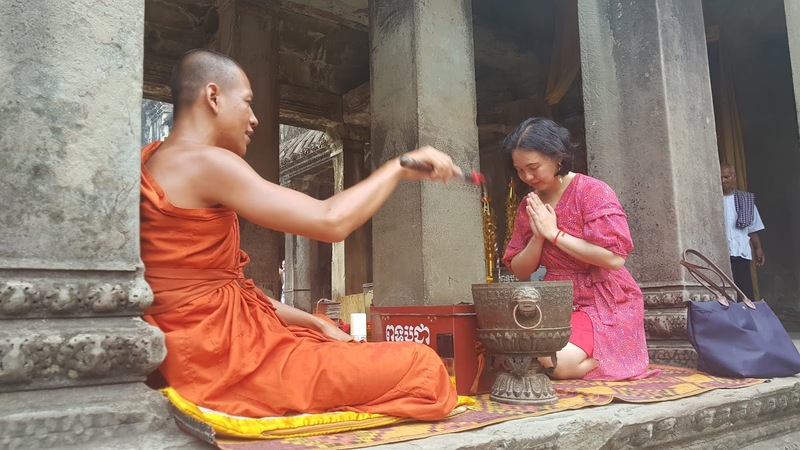 Plane ticket to Cambodia bought and by March I was off to cross off an item from my bucket list! 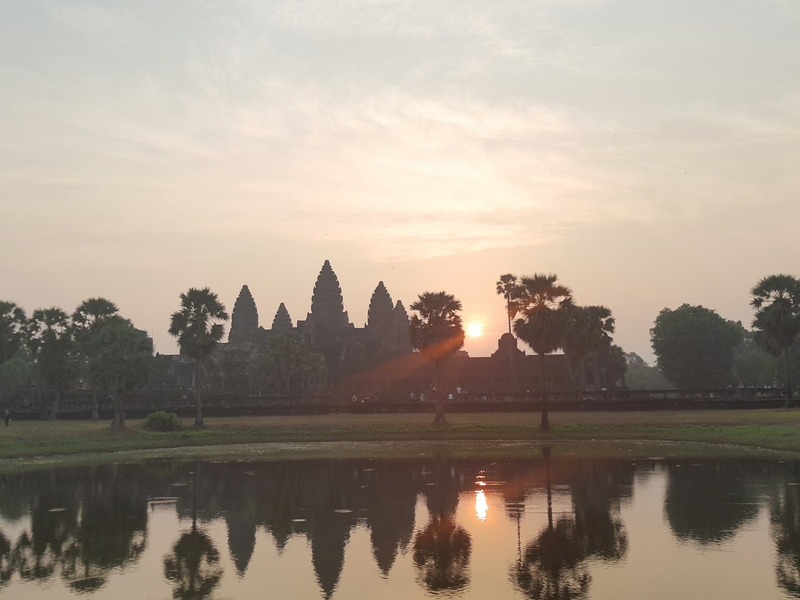 We woke up at dawn just so we could witness the sun rising behind the towers of Angkor Wat. The best shot of Angkor Wat is to see all five towers reflecting on the lake. It took me a while before I could take a photo like this. There were already a lot of people waiting for the sun to rise by the time we got there! The sun rise during the time of our scheduled visit was at at 6:45AM. Here it is finally beginning to show. This part of my life is called achieving a goal from my bucket list. It's a marvelous sight to see! Well worth getting up at 4 in the morning so that I could witness this. 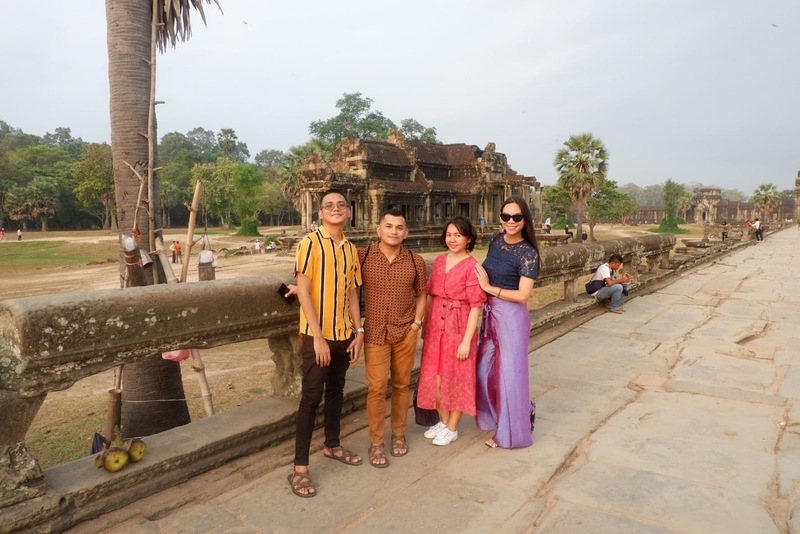 We booked this experience via Klook called the Angkor Temples Sunrise Tour. Affordable enough at Php500+ per person. A van, a tour guide and water are provided when you book this. Meet our tour guide, Kim. Kim speaks good English and gave us some really good insights about the temples. But what we liked most about him is he's quite the funny guy. Not HAHAHA funny but you know quite amusing. He also took good photos of us! Sometimes he'd ask us to pose somewhere and we'd already be smiling for a minute or two and the photo has not been taken yet. We'd find ourselves whispering to each other with that smile frozen on our faces, "Anu na? Antagal." Turns out he's tinkering with the phone for a better shot. Part of our tour are the three main temples: Angkor Wat, Ta Prohm and Bayon. Angkor is considered to be an important archaeological site in Southeast Asia. It was the center of the Khmer kingdom for centuries.Trivia: Angkor literally means Capital City. 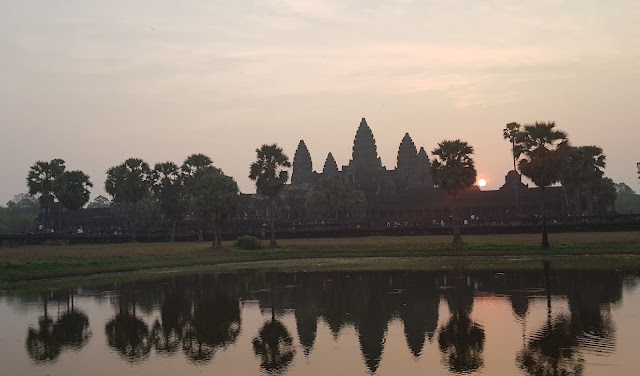 When the sun had finally risen, we proceeded to explore the rest of Angkor Wat. Outfit details: Plains and Prints dress; Superga sneakers and my ever trusty Longchamp bag. 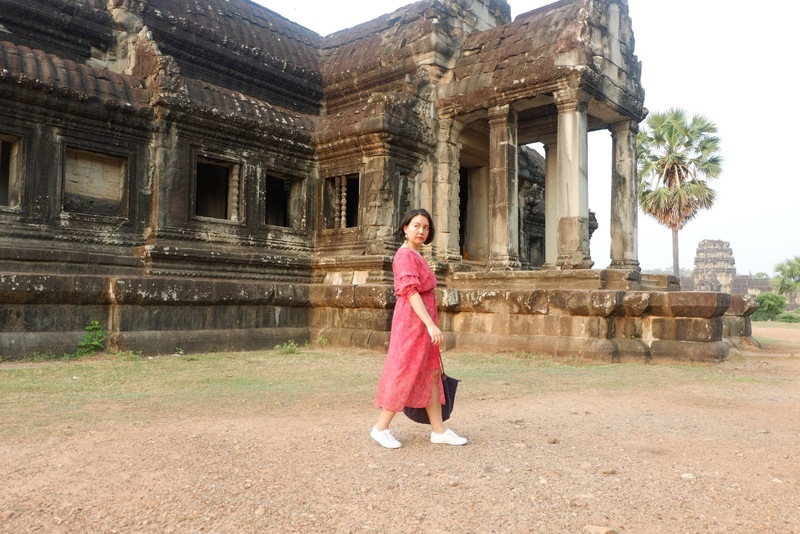 It's a temple so I had to dress respectfully especially since I didn't want to have gone to Angkor Wat only be turned away because I wasn't wearing the right clothes. Made sure to pick a light and flowy outfit despite its length because I know it was going to be hot. I also brought water in my bag to help quench thirst from walking around. I think my red dress stands out wonderfully from the dark colors of the temples. When we saw a monk seemingly praying over visitors who approach, Ver and I decided to get blessed. Kim told us we could get blessed for any intention - health, career, family, love, etc. You just have to donate any amount. 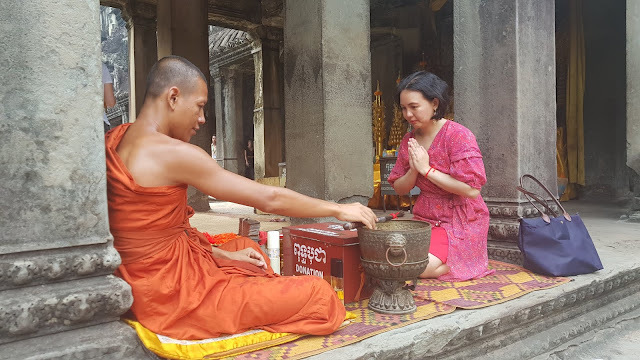 The monk sure was generous in blessing me with water. I got pretty soaked!😆 I hope what I prayed could be granted. This photo of ours kind of reminds me of the Planeteers. We're earth, air, water and fire. 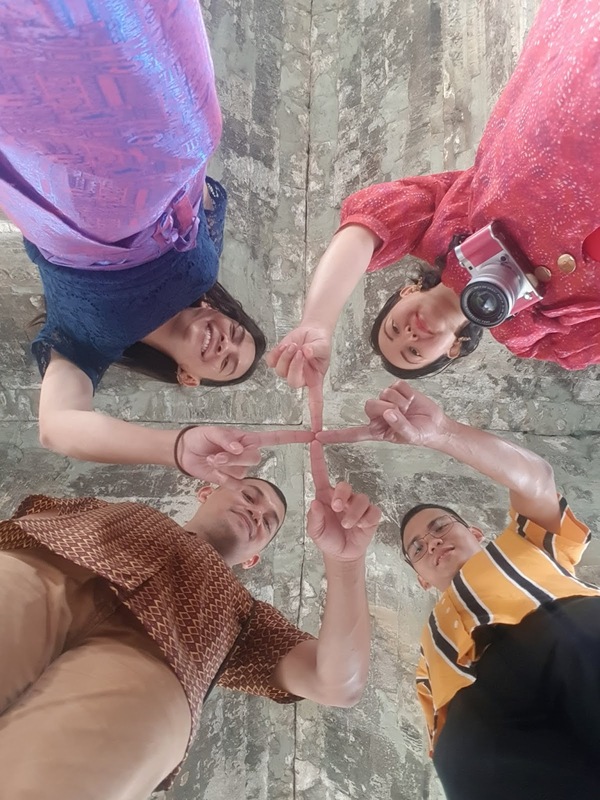 But also, those are Cambodia's four elements as explained to us Kim who made us do this pose while he showed us around the Four Elements Temple. Angkor Wat is just one of the many temples in Angkor complex. I honestly didn't know that 'til this trip. Luckily, to get from one temple to another, we had that van to take us around because the heat in Cambodia is just too much to take even for me! We proceeded to our next temple visit within the complex after lunch. 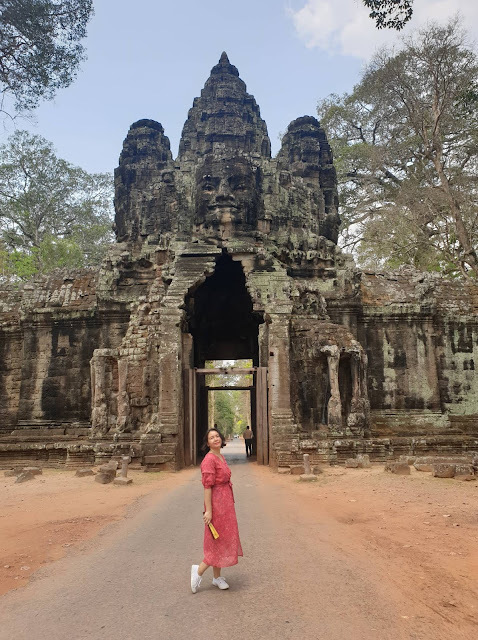 Next stop was the famous Tomb Raider temple, Ta Prohm. I've never seen the movie that starred Angelina Jolie though. I should get to watching it. This fan I'm holding is one I bought from one of the kids selling it around the complex. Somehow they could tell we were Filipinos and so when they approached us they would say "100 pesos. Lady, fan. 100 pesos." Another favorite thing that the locals, not just the kids, at Angkor complex kept saying to us was "Filipino? Manny Pacquiao. Pak pak ganern." Ta Prohm is a jungle temple with a lot of huge trees and massive roots that seems to be growing out of its walls. 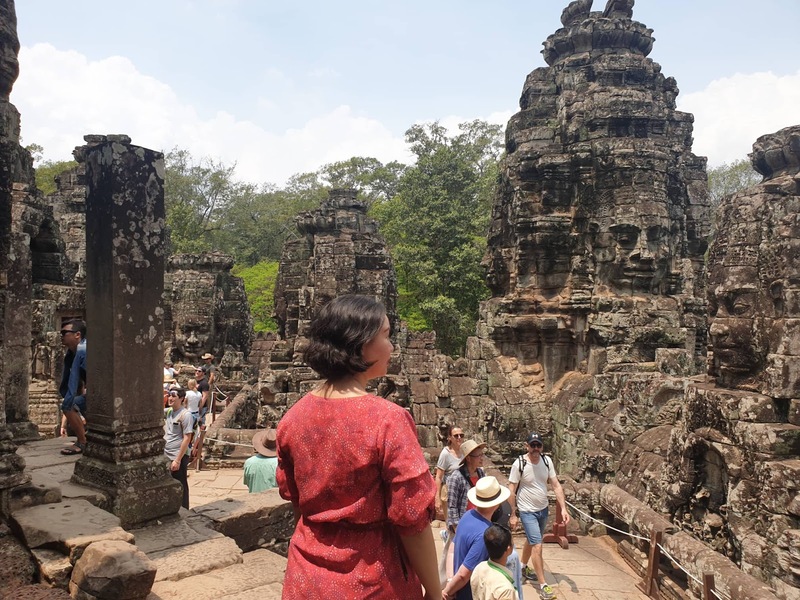 Unlike Angkor Wat which was originally a Hindu temple before it became a Buddhist one, Ta Prohm was intentionally built for the latter religion. 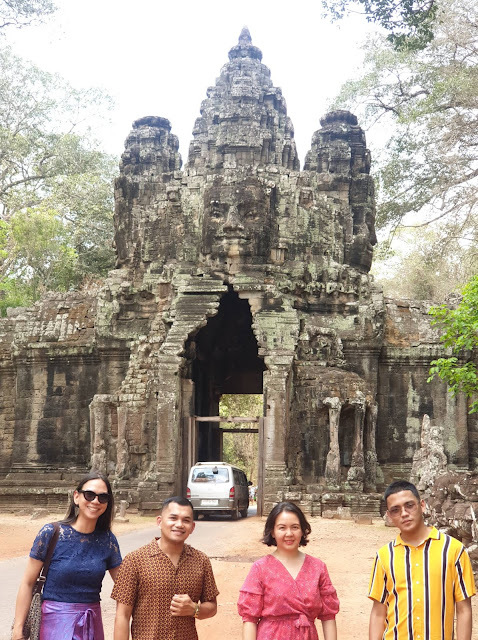 We also passed by Angkor Thom, which name means the "Great City", on our way to Bayon temple which is located inside the walls of this city. This served as the new capital of the city after the old one was destroyed. And finally, Bayon Temple. This is part of the major three temples in the Angkor Complex and also usually included when you avail of Angkor tour. You can tell pretty much tell the differences of the three temples because they all have very different designs. Bayon can be easily identified because of the faces carved on the stone walls. As you go around this temple, you'd see a lot of these faces surrounding you. Our tour guide, Kim, described to us a couple of these faces. There was the beautiful face and the happiest face. Truth be told I couldn't really tell one from the other. 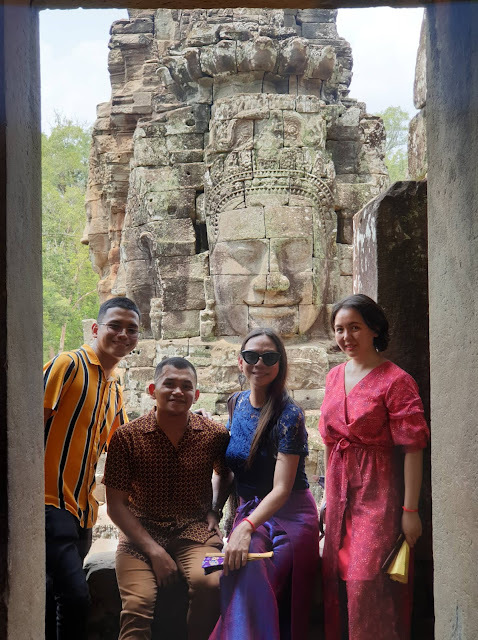 Bayon also has various passages that you can explore. 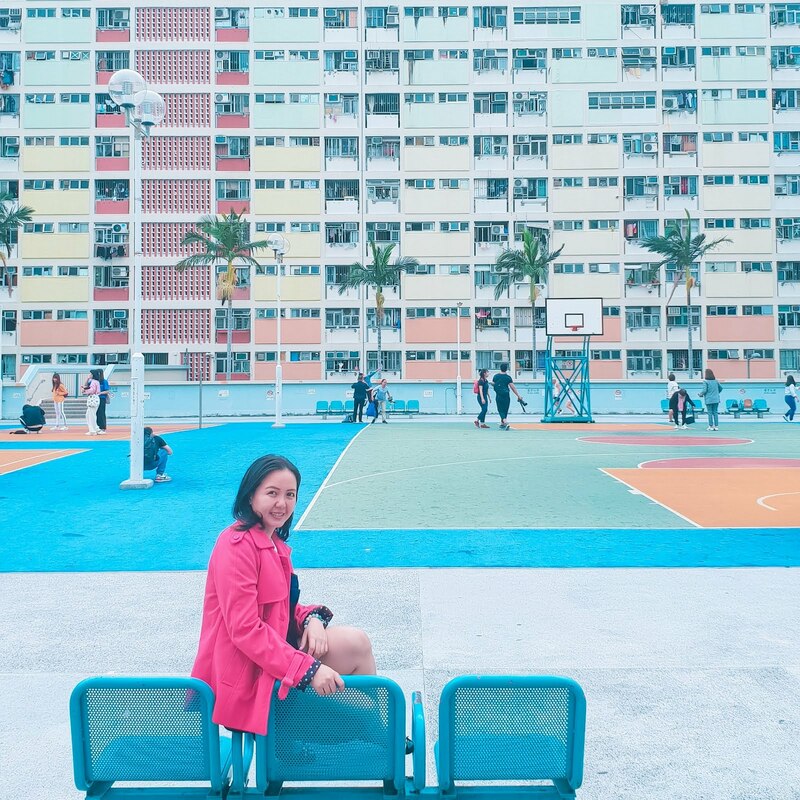 Every corner is also a place where you'd love to take photos on. From the first level, it's quite hard to appreciate the designs of Bayon Temple. At least that's how I felt. Not until I climbed up the levels that I was able to appreciate it. So that ends our tour of Angkor. By the afternoon, it was back to the hotel for us to rest and clean up. 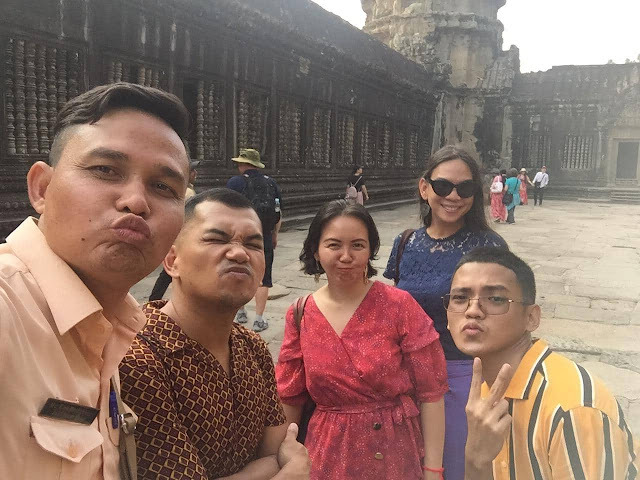 We originally planned to go back to Angkor temples by late afternoon to watch the sunset since our Angkor pass was good for a whole day but once we got back to the comforts of our room, we knew there was no leaving 'til the sun was down.😆 Still it was a beautiful tour and despite the exhaustion from the heat and the early morning wake up call, I'm happy to have witnessed the sun rising at Angkor Wat and to see the other temples, learning more about Cambodia's history.